Is Playing Fantasy Sports Online For Real Money Legal? Is it legal to play fantasy sports for money? The quick answer is "Yes", playing fantasy sports in online leagues for money is 100% legal. Unlike other forms of gambling, such as poker or sports betting, playing fantasy sports is considered a game of skill. In 2006, Fantasy Sports Pools and Games received a specific exemption from the Unlawful Internet Gambling Enforcement Act (UIGEA). Ever since then, a number of daily fantasy sports sites for money have started popping up online. The whole question of legality revolves around the wording that: "a game of skill is classed as game where skill is the predominant factor in determining the winner". The majority of U.S. States and Canada have ruled that fantasy sports is a game of skill and therefore legal. Of course we recommend to check your local laws - as in some states in the USA there are some grey areas about fantasy sports and other types of online wagers. What was once just a "friends in the basement once or twice a year fantasy pool" has grown into a billion dollar a year industry. The National Football League (NFL) now features fantasy stats prominently during games to help promote their year-long affiliation with fantasy leagues. With fantasy sports being 100% legal, the big leagues are busy drafting their way to real money. Now with sites such as FanDuel and DraftKings, online fantasy players can play their favorite sports every day and win real money doing what they love. Fantasy baseball offers players the most opportunity with an average of a dozen games per day for over six months of the year. But sports fans can also engage in fantasy football leagues, fantasy hockey pools, nba daily contests, NCAA college basketball and football and even fantasy Nascar, golf and PBR (Professional Bull Riding) games for real money - and it is all legal! With fantasy sports being legalized, players don't feel the need to hide what they are doing online and can comfortably play knowing that this has become an accepted pastime, unlike the problems for online poker players. Deposits and withdrawals are also much easier as most sites take credit cards, paypal and wire transfers without issue. So, if morals have kept you from stepping into the next big thing in online fantasy sports, rest assured, you are not doing anything illegal. 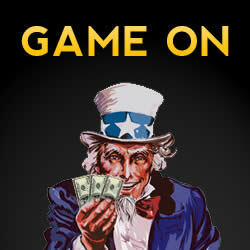 Jump on the bandwagon check out our fantasy sports promotions and start playing fantasy sports for real money!